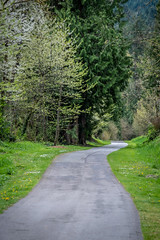 King County Parks crews will begin grading work on the Snoqualmie Valley Trail from Duvall south to NE 124th St on Tuesday, 5/31 through Thursday, June 2. The trail will be closed during this work from 7:30 a.m. to 3:30 p.m. each day of the closure period. Thank you for your patience during this important grading work. If you have any questions, you can contact us at 206-477-4527 or via email. Stay up-to-date with construction on our regional trails this summer by signing up to receive alerts. You can do this by entering your email in the upper right corner of this bulletin.